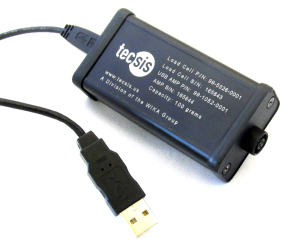 The new Model ILAUSB-10 USB Signal Conditioner from tecsis LP provides plug & play convenience for strain gauge load cells and pressure transducers. Simply connect the ILAUSB-10 to your PC via the USB port and convert the sensor input to a digital output ready to communicate directly to your PC. The included software will extract data from the sensor and instantly allow data manipulation without the need for amplifiers, filters, multimeters, or external power supply. It is the ideal low cost data acquisition solution for high precision test and measurement applications. As an inexpensive alternative when a high end data acquisition system is not called for, the ILAUSB features powerful functionality for a variety of load, force, or pressure data acquisition needs. The unit logs input values to a CSV file at up to 100Hz which can then be analyzed in Microsoft Excel. Features include two-point auto calibration and the ability to control the system zero, over & under range limits, engineering units, measurement rate, and various filter setting. Available now from tecsis LP, priced from $499. tecsis LP, 771-F Dearborn Park Lane, Worthington, Ohio 43085. 614-430-0683, info@tecsis.us, or www.tecsis.us. tecsis LP is an ISO Certified company.